The South Okanagan has some excellent public golf courses, along with a climate that is conducive to a long golf season. The South Okanagan has some excellent public golf courses, along with a climate that is conducive to a long golf season. Tucked into the Similkameen Okanagan Valley is a golf course most travelers bypass, but golfers/RV’ers should visit. This hidden gem is Twin Lakes Golf Course and RV Resort. It is not often you can stay in a comfortable RV Park and have only a chip shot to the first tee. The resort is located 20 km southwest of Penticton along Highway #3. Twin Lakes is situated in a valley that had been used for mining and a cattle ranch. The owner, Rick Shillito of Penticton, first developed the front nine on the lower half in the late 1960’s. Fifteen years later, he added the back nine on the upper level. Connecting the two nines is hole #12, a Par 5, all uphill and 465 yards from the back tees. It is also one of the narrowest holes on any B.C. golf course, being only 50 yards wide at one point. Leave the driver in the bag and go with a seven or six iron for a well-deserved par. Other than a couple of holes, the course has generous fairways and surrounded by fir, ponderosa pines, deciduous trees and bordered by rock outcroppings. The 18 hole, par 72 course is divided into two parts. The entire front nine is on the lower shelf with hole #7 running parallel to the Crowsnest Highway. The back nine starts with the Signature Hole, hitting down into the valley and onto a well guarded sloping green. After mastering hole #12, holes #13 - 18 are on the upper flat section of the course. Just prior to teeing off, a deer walked onto the first tee and seemed to be waiting for his turn to play, before wandering down the fairway. The course ranges from 5,446 yards for ladies to 6,867 yards from the back tees, for those long off the tee. Water only comes into play on three holes, #8, 11 and 16. CR is 71.9 [back tees] and the Slope is 125, making Twin Lakes a good recreational course for all levels of golfers. 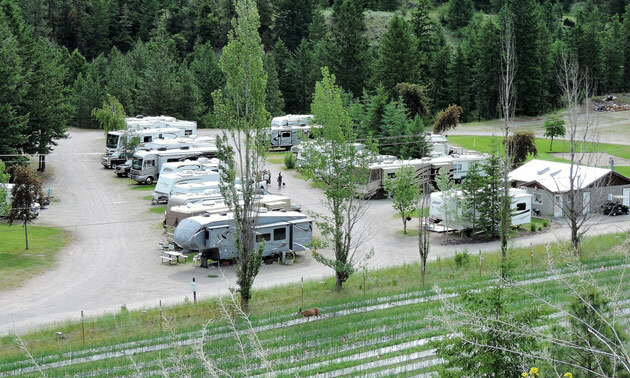 Situated just off the parking lot is the RV Park. It consists of 39 gravel sites, can handle all styles of RV’s, but has only 15/30 amps. The amenities include showers, laundry facilities, dump station, fire rings, WiFi and is pet friendly. The resort offers Stay and Play Packages, saving on green fees. A nice feature of the park is that trailers are available to rent on a weekly basis or store your RV over the summer months. What grabbed my attention was $10.00 Tuesday. After 12:30 pm, it cost only $10.00 to play a round of golf, which is the best deal in the province. The course has a full range of services from a driving range, putting/chipping green, well stocked Pro Shop, snack bar and restaurant/lounge. Twin Lakes also features Men’s Night, Ladies Day and Senior Men’s Day, as well as hosting local golf tournaments. General Manager, Kate Trahan, and her staff have put together a nice vacation resort as well as attracting the locals. 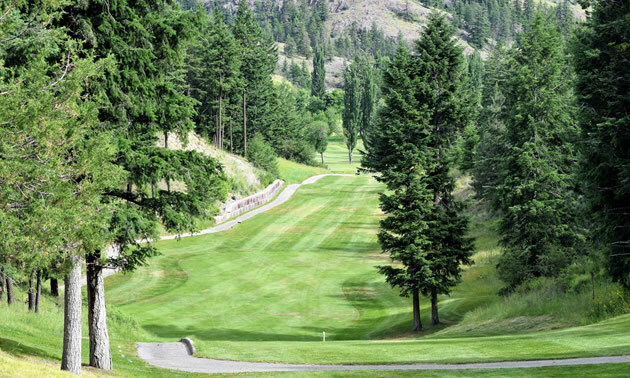 If interested, Twin Lakes is only one of many golf courses that is part of the South Okanagan Golf Trail, which includes Fairview Mountain, NK’MIP Desert Canyon, two courses in Osoyoos, Penticton and Summerland. There is no shortage of good golf courses in the South Okanagan.